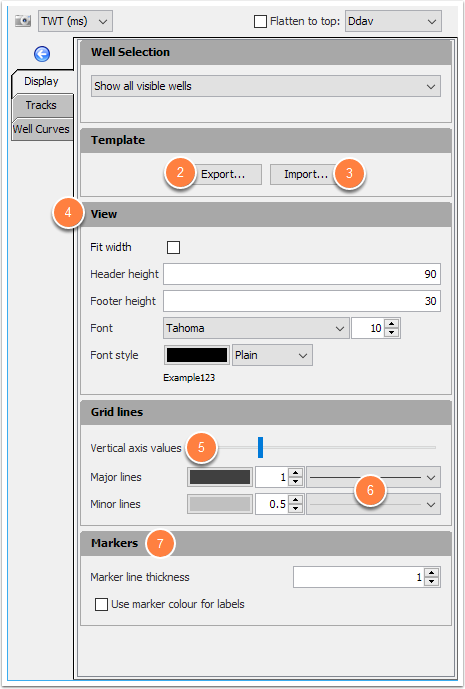 In Single Well View and Well Correlation View, the configured tracks and curves are saved as template files. Template files contain all the settings and information required to recreate the the view. These files can be shared between sessions, projects and users to avoid recreating similar displays. The Display tab also allows you to manage well curve templates and adjust settings for the entire view. Templates can be exported to files and re-imported. These files can be shared between users, projects, sessions and between Single Well View and Well Correlation View. Click the Export button to save the template in your desired location (or to the default Insight folder). The template file extension is .duwt by default. Click the Import button and browse to the location of the file (*.duwt) to load exported templates from earlier sessions. Adjust the Vertical axis values scrollbar to increase/decrease the vertical time/depth domain track value. The width and colour of the well track axes can be modified by changing Major and Minor lines value. Note: Insight will prompt you to export the Well Template when you exit the Well View window. Click Yes to close without saving or No to return to the window.